Rescued pond sliders basking beside their pond. Turtles can make interesting pets but they can require a great deal of care to keep them healthy. This care sheet provides some basic guidelines to help ensure that your water turtles live long and healthy lives. The outdoor guidelines are for the care of hardy water turtles such as sliders, cooters and painted turtles in the mild southern California climate. Turtles not native to the U.S. or kept in areas with more severe climates may have special needs. Keeping your turtle outdoors is more likely to duplicate its natural environment, and is the only practical way to provide a large swimming space for adult turtles. Turtles can be kept outdoors in a pen containing a pond (this can be as simple as a child's plastic wading pool) with rock or cinder block islands, or floating logs or cork boards that the turtles can bask on. Many water turtles actually spend a lot of time out of the water basking, and females must be able to climb out onto land to lay their eggs, so provide a land area around the pool with vegetation in which they can hide and burrow. Pens for hatchlings or small turtles should be covered with screening to prevent them from being eaten or injured by birds, cats, dogs and other animals. 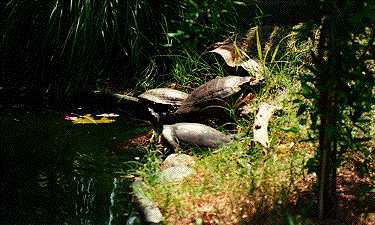 The pond should have shady areas so that the turtles do not have to stay in direct sunlight during the heat of the day. A board placed over a portion of the pool, or a few clumps of water hyacinth or water lettuce will provide needed shade. NEVER put turtles outside in a glass aquarium, it will heat up like a greenhouse making the water dangerously hot. Be aware that raccoons live in many urban neighborhoods, and that turtles are one of their favorite foods. It may be necessary to fence off the pond and enclosure to protect your turtles from these marauding predators. A large heated aquarium with a swimming area at least as deep as the width of the turtle, and a rock, shelf, or similar structure where the turtle can get completely out of the water provides suitable indoor quarters. Some baby turtles are best reared in very shallow water, allowing them to feed in slightly deeper water. The setup must be completely dismantled and scrubbed with bleach from time to time to reduce the risks of disease. A calcium block made from plaster of Paris, or one purchased from a pet store, should be placed in the water. The water temperature should be maintained at 75-85° F, so provide a heat source such as an aquarium heater in the water or an overhead light placed over the basking area. Natural sunlight provides the ultraviolet light that is essential for turtles to properly utilize calcium and to properly assimilate their food. The ultraviolet rays in sunlight are also beneficial for curing sundry minor scratches or skin ailments. Because sunlight is deprived of its value when filtered through glass, turtles housed indoors need to be given regular sun exposure or an artificial substitute such as light from a Vitalite, or a similar full-spectrum lamp. These full-spectrum lamps are fluorescent lights that emit small amounts of beneficial ultraviolet light. The amount of ultraviolet light emitted diminishes with use and these tubes should be replaced at least every six months; more frequently is often recommended. The Vitalite should be turned on for at least 12 hours a day and turned off at night to simulate natural day/night conditions. Most water turtles must be fed directly in the water, otherwise they cannot swallow. Potential food items include lean beef, fish, earthworms (nightcrawlers), meal worms, and feeder goldfish and guppies. Many hobbyists feed their water turtles entirely on prepared balanced foods such as Tetra ReptoMin or Purina Trout Chow, which can be bought at animal feed stores. Do not use so-called "ant eggs." Some hatchling and baby turtles will only eat live foods. They can be offered brown or black worms (available at tropical fish stores) and brine shrimp. Live food may carry infectious bacteria, so be certain to rinse the worms well and obtain worms and live fish from a clean and healthy source. Water turtles will often take leafy vegetables and even fruit such as banana or papaya. The food should be supplemented with calcium (calcium carbonate, crushed limestone or crushed oyster shell), and powdered vitamins (reptile vitamins or Superpreen bird vitamins). Water turtles can be fed in a "turtle meatloaf," a basic recipe for which consists of 1 teaspoonful of calcium carbonate and 1 tablespoon of vitamins mixed with 1 pound of very lean ground beef. Turtle meat-loaf can be made in advance, and stored frozen in serving size portions. Defrost it thoroughly prior to feeding. Small turtles should be fed every day and larger ones two to three times per week. Always remove excess food when the turtle shows no further interest in it. Many hobbyists move their turtles to a separate container for feeding. This reduces the risk of food spoiling and fouling the water, but some turtles will not feed when they have been disturbed. Most turtle ailments are the results of improper diet, lack of natural sunlight, poor hygiene, or being kept at too low a temperature. Sick turtles should be isolated from other turtles, as should all newly acquired turtles, for at least 6 weeks (6 months is preferred by some hobbyists) and watched for disease symptoms before being placed back with your others. Fungus appears as white or gray specks, furry spots or lumps on the fleshy parts. Adding 1/4 cup table salt to each five gallons of water is a good preventative. Fungus remedies sold for tropical fish can be added to the water. Shell and skin fungus can be painted with a 2% gentian violet solution and allowed to dry for 6 hours before putting the turtle back into clean water. Natural sunlight is beneficial, but be careful not to let the turtle overheat. Shell rot is a serious problem. Symptoms include a discoloration under the shell surface, soft or spongy areas on the shell surface, and discharge of a rotten smelling liquid when the area is squeezed. The rotted areas must be scraped clean, and covered with Gentocin or Polysporin ointment for 3 days. The treated area is then painted with gentian violet every 2 days until it dries out. During treatment the turtle is kept out of water except for a daily soaking and during feeding. Swollen eyes and a soft shell may be due to a poor diet and a lack of natural sunlight. Add vitamins and a calcium source to the diet, and give the turtle access to unfiltered sunlight or a Vitalite. Ophthalmic ointments applied under the eyelids may be beneficial. Turtles are highly susceptible to respiratory tract infections. Symptoms include listing to one side when floating, gasping, a runny or bubbly nose, and swollen eyes. The turtle should be kept warmer than usual (85-90° F). If these conditions do not improve in a few days consult a veterinarian. Flesh injuries resulting from bites, scratches, or cuts can be treated with antibiotic ointments such as Polysporin or Terramycin. Apply twice daily and keep the turtle dry for 8-10 hours after each application. Injured turtles must be brought inside immediately to prevent flies from laying eggs in the wound and producing a maggot infestation. If physical injuries occur try to eliminate the cause. Basking rocks should be checked for sharpness and replaced if too sharp or abrasive. Make sure that nothing can trap the turtles underwater since they can drown. In the remote chance that this should happen, it may be possible to revive the turtle by pushing or pulling the limbs in and out of the shell to force air into the lungs. When it is breathing on its own, put the turtle on dry land to rest and recover. Before putting it back in its home, correct whatever condition caused the near-drowning. Certain odd occurrences and behaviors may cause alarm but are completely normal. Turtles shed their skins periodically, and some turtles shed the transparent covering of the scutes on the outside of their shells. In the fall turtles may refuse to feed and behave sluggishly, but this is a normal prelude to hibernation. During the breeding season females may become very restless, refuse to eat, and pace around the enclosure as they look for a suitable place to lay their eggs. Remember that turtles, like all other pets, can carry disease. Keepers must observe strict sanitation practices. Do not eat or drink while doing maintenance, and wash your hands with soap and hot water after handling your pets and after performing maintenance chores. Young children should not be allowed to handle turtles without adult supervision. Turtles kept indoors in heated enclosures will stay active all year, although they may eat less in the winter. Turtles kept outdoors in Southern California will become less active and will stop feeding during the coldest part of the winter. Some may leave the water and burrow into piles of leaves and vegetation. Most turtles native to the USA can pass the winter quite safely in this fashion. Visit CTTC's Chelonian Archives and The Turtle Gallery for more information on specific turtle species.